Scarification is an essential part of any garden maintenance programme. Without it, your lawn will be highly susceptible to diseases caused by natural bacteria in the soil. We at Lawn & Weed Expert have more than 20 years’ experience helping customers across South Wales to keep their lawns in tip-top condition. We use state-of-the-art scarifying equipment to ensure that your grass stays healthy all year round. Our lawn scarification service is efficient, affordable, and highly effective. Contact us today for a FREE lawn survey. Scarification is the process of pulling dead moss and thatch out of your garden lawn. This used to be done using a wire rake, but we use powered machines that get the job done more efficiently and more thoroughly. In the short term, scarifying will actually make your lawn look worse, but once it recovers it should be far healthier than before. 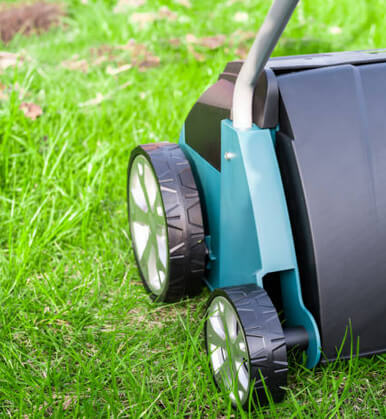 Lawn scarification should be strategically scheduled to ensure that it is followed by favourable weather conditions that assist with the lawn’s recovery. Moss control should be carried out 2-3 weeks in advance, as scarifying can otherwise end up spreading moss spores across the lawn and making things worse than before. It’s a good idea to scarify every 2-3 years at minimum (depending on soil and weather conditions), but the specialists from Lawn & Weed Expert will advise you on the best course of action for your garden. If dead moss and grass stalks are left undisturbed on your lawn they will turn into thatch (a build-up of dead organic matter that lies on the soil surface). Thatch prevents the flow of moisture to the grass roots, and can thus end up weakening and even killing the grass in your garden. During wetter periods – i.e. autumn and winter – it can also create damp, humid conditions that encourage moss growth and promotes grass diseases. Vigorous scarification will remove thatch from your lawn and allow the grass underneath to grow normally again. If your lawn feels thick and spongy, scarification may be necessary to remove the layer of thatch. Our lawn scarification service is available in Cardiff, Newport and Swansea, as well as most other locations across South Wales. Call Lawn & Weed Expert on 0800 111 4958 to arrange a FREE lawn survey.